Microsoft’s Bing has for the first time taken the number two spot from Yahoo in the battle for search engine traffic in the US. Of course, Google is still way ahead of the pack and looks unlikely to be caught any time soon, according to data released by research firm comScore on Wednesday. Data collected by comScore for web searches made last month shows Bing and other Microsoft sites accounted for 15.1 percent of all Internet searches, with Yahoo clocking up 14.5 percent. In November it was much closer, with Yahoo’s 15.1 percent placing it a shade ahead of Bing with 15.0 percent. Google, however, remains top of the pile, and even showed a slight improvement for month-on-month figures. December saw it take 65.9 percent of search traffic, up from 65.4 percent in November. 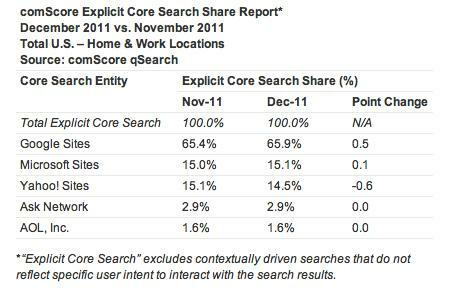 Google’s gain was the biggest among the top five search engines surveyed by comScore, which also included Ask and AOL. Microsoft launched Bing in May 2009. In early 2010, Microsoft struck a deal with Yahoo whereby Yahoo’s search results would be generated by Bing, with the two companies sharing revenue generated by advertisements. According to an AP report, the deal was attractive to Microsoft for reasons other than the extra revenue it received—it gave the company access to masses of extra search data, allowing it to improve Bing’s algorithm through analysis of the billions of searches made by Yahoo users. When the tie-up between Bing and Yahoo took place in 2010, Yahoo enjoyed around 19 percent of the search market. In contrast, Bing has climbed from about 9 percent. If the current trend continues, the gap will further widen in Bing’s favor, though one wonders what it must do to make a dent in Google’s seemingly unassailable lead.